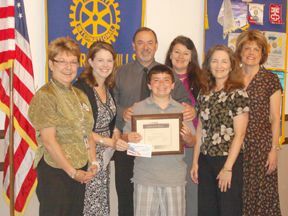 Garrett Portela, 5th grader at William Brooks Elementary School, was honored as Student of the Month at the June 2 El Dorado Hills Rotary meeting. In recognition of his selection, Garrett received a certificate and a $100 savings bond. With Garrett are: Principal Kathi Jensen, teacher Kelly Werly, parents Eric and Debbie Portela, Rotary President Kathy Witherow and Buckeye Supt. Terry Wenig.